Including a cool, new electric car. It isn't much of a secret that the Buick brand has mostly been kept alive thanks to strong sales in China. So we weren't surprised when the company announced it had a few cars set to be revealed at the 2019 Shanghai Auto Show. The most interesting of the big reveals is the brand's first ever electric car, the Velite 6. Buick was rumored to be working on a new electric SUV built on an all-new platform for the US but this Velite 6 will be a China-only model. We do like the Velite 6's wagon body style but with just 114 horsepower and 188 pound-feet of torque as well as a driving range of only 187 miles, it won't be pined after by EV lovers here in the US. It is cheap though, as Buick says the Velite 6 will cost the equivalent of just $25,000 in China after government subsidies. 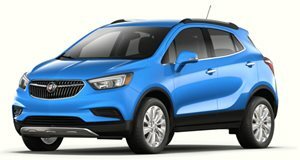 Buick also revealed the 2020 Encore and Encore GX, which may hit closer to home in the US market. We still don't have much information about either of these new models other than the Encore GX will be a larger version of the regular Encore. In China, they will be offered with a range of eighth-generation Ecotec engines mated to a new nine-speed transmission or a new continuously variable transmission (CVT). The US will likely have different engine options and we don't know whether we will receive the regular Encore or the larger GX model. The last reveal is a luxury minivan called the GL8 Avenir Concept. Buick has been selling the GL8 minivan in China for several years now but this new Avenir Concept looks remarkably upscale. With minivan sales dwindling, we doubt Buick would consider selling the GL8 in the US but if Lexus does decide to enter this market we could see Buick decide to retaliate.